Vienna Acoustics THE KISS. 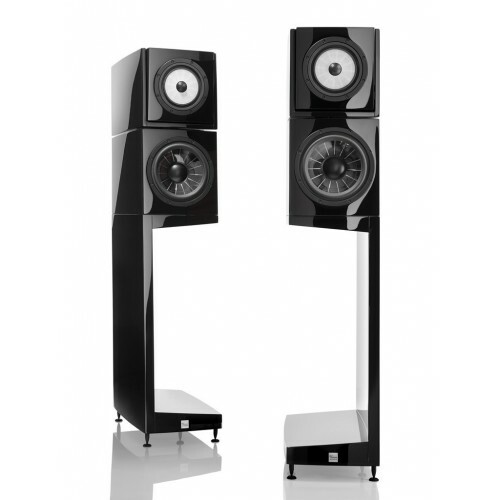 Floorstanding Speaker. PAIR. Named after Gustav Klimt's masterpiece ("Der Kuss") and with an appearance worthy of a contemporary work of art (of which stands a fully integrated support in the room) and a construction and finishes of a rare perfectionism , The Kiss is an exclusive compact monitor that includes one of the revolutionary coaxial transducers with flat diaphragm of 180 mm diameter of Vienna Acoustics mounted in an independent enclosure. As far as the reproduction of the lower part of the spectrum is concerned, Vienna Acoustics' new absolute reference monitor incorporates a unique 230mm "Spider Cone" transducer mounted in a separate enclosure that allows a unique combination of Extension and control. As it could not be otherwise, the filter of frequency of The Kiss is a prodigy of engineering and quality of the constituents that constitute it in order to ensure the perfect preservation of the tonal and spatiotemporal details of the signal of Audio. Compact 3-way monitor / 3 speakers. Enclosure divided into two blocks completely independent and decoupled from each other. Woofer 230 mm with cone "Spider Cone" exclusive of Vienna Acoustics. Frequency response of 38-20,000 Hz. Sensitivity of 89 dB / W / m.
Amplification power between 50 and 180 W RMS. Dimensions / Main enclosure weight: 273x540x540 mm (W x H x D) / 43 kg. Dimensions / Weight of the dedicated stand: 273x730x530 mm (W x H x D) / 23 kg.